Some Neopets like to go on adventures, exploring ancient ruins, collecting treasure, and battling the forces of evil. Others prefer to spend their weekends playing ball games in their gardens, banking shots off of potted plants and trying to avoid upsetting the gnomes. It's best not to upset the gnomes. In Wingoball you control the arm of a blue Mynci, moving your mouse cursor up and down within the playing area to change the angle of your shot. Once the arm is positioned at the desired angle, click to throw the ball. 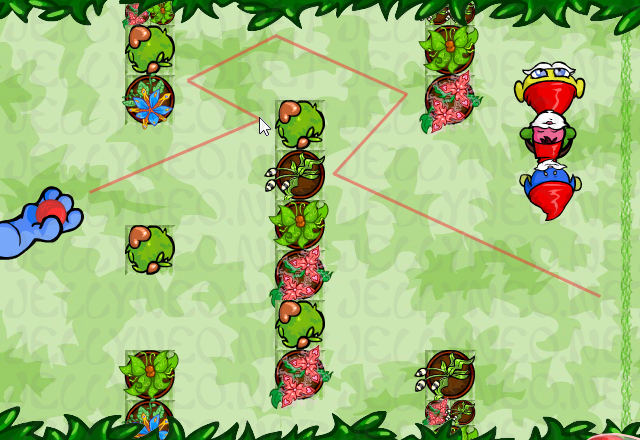 Your goal is to get the ball across the line at the right side of the field, though as you progress the placement of obstacles will make this increasingly difficult. C'mon, guys, I'm trying to play here! While your ball will harmlessly bounce off of most objects, gnomes are a special case. 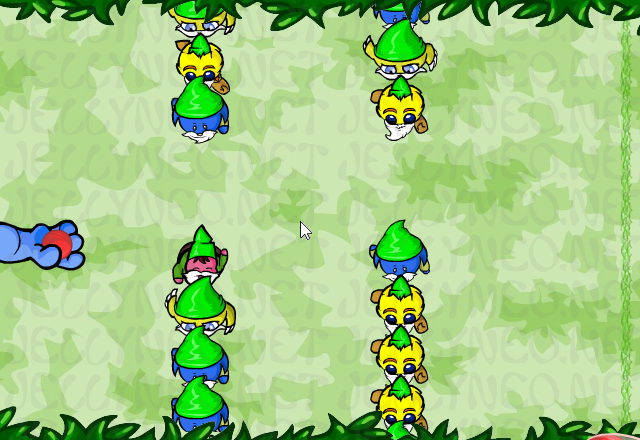 Green-hatted gnomes behave like other objects, allowing your ball to bounce off of them, though in some levels they can be found marching up and down across your path. Gnomes in red hats, however, will take your ball, forcing you to throw another. While you have an infinite supply of rubber balls, you're given just thirty seconds to complete each level, so losing a ball will cost you time. If you run out of time on a level, the game will end. There are two ways to earn points in Wingoball. The first is the time bonus: for every second left on the clock, you will be awarded 1 point. This doesn't mean that you should rush and try to beat the levels as quickly as possible, however, because you will also earn a bonus of 25 points if you manage to pass a level with just one ball. When trying for a high score, you must be able to both play quickly and beat each level with a single ball. The top scores for the game are often above 1,330 points, which averages to 53 points scored on each level (25 points from using one ball, 28 from the time bonus). To achieve this level of speed and precision, you must note exactly where shots need to be aimed, and position your cursor before the level starts. 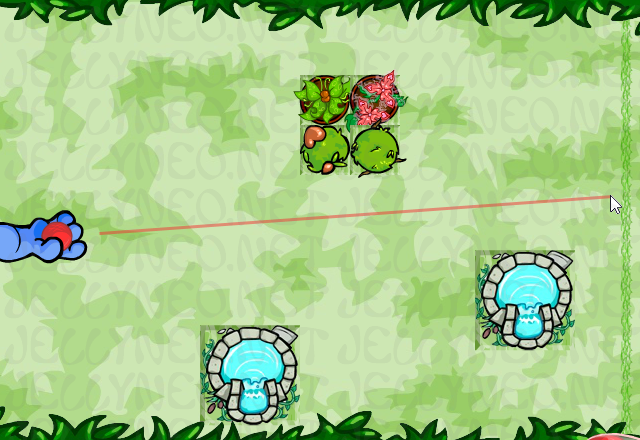 You can also use this time to wait for any moving gnomes to reach a position that will allow your ball to pass through more easily. See the Level Solutions section below for guides on where to aim your shot in each level. If you would like to suggest alternate routes through the levels, let us know! Gnomes in red hats will steal your ball if you allow it to touch them. Aim your shots before starting a level's timer for a better time bonus. You will be awarded 25 points for beating a level using only one ball. You will have a chance to check this guide before starting each level. 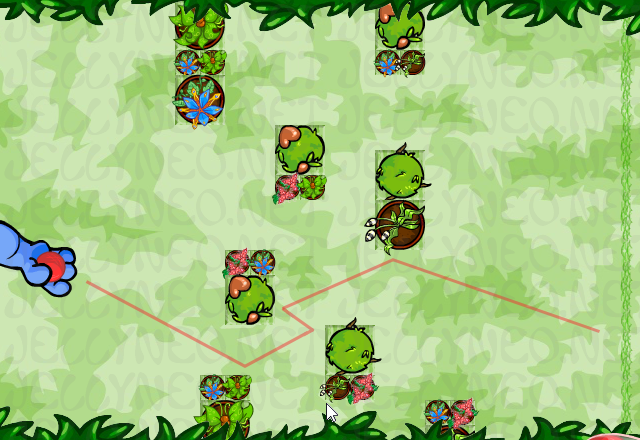 This guide will show where you must click for your ball to pass through the level (indicated by a cursor icon), and the path it is likely to take. To use this guide, simply click on the yellow arrows to view the next or previous level, or select a level from the drop-down menu. Level 1The first level starts out easy, with a straight shot through the middle of the screen to the goal. Click anywhere between the obstacles to proceed. Level 2This level introduces bouncing your ball off of obstacles with a simple maze. 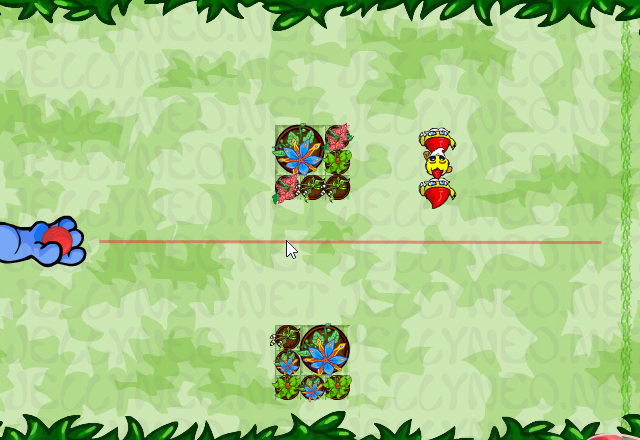 Position your mouse under the second plant, or in that general vicinity . 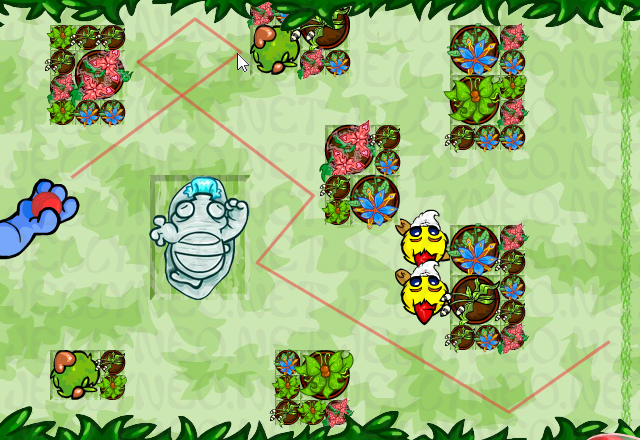 You may have a different plant (or two smaller plants) in place of the blue flower seen in the screenshot; this is due to the plants being randomized at the start of each level, and doesn't affect gameplay. 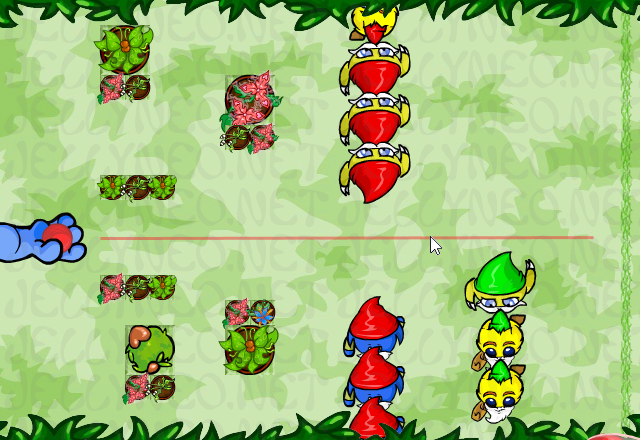 Level 3This level introduces gnomes, which walk up and down in a set path in front of a column of plants. Wait until they're out of the way, then throw the ball through the gap between plants. Level 4Wait until the path is clear of gnomes, then bounce the ball against the top or bottom of the play area. 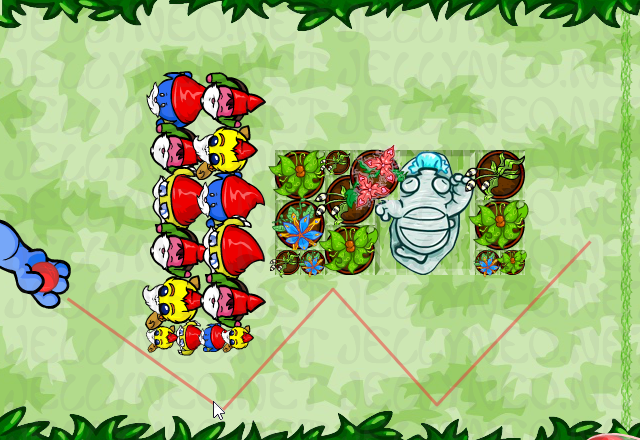 If you would like to clear this level as quickly as possible, watch the movements of the gnomes on the screen before the level starts, and start the level when they're all out of the way. 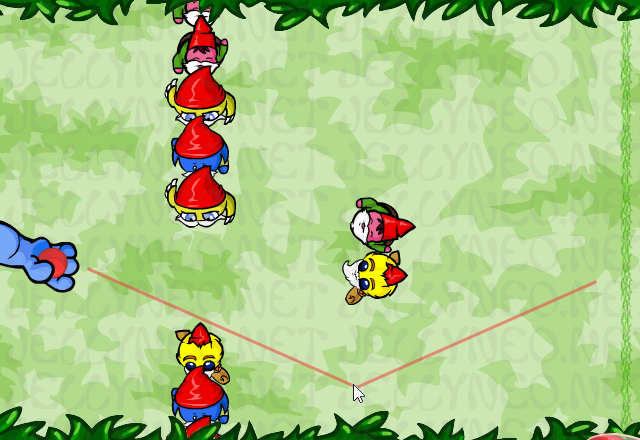 Level 5This level introduces red-hatted gnomes, which stand in the center of the screen. Throw the ball above them to proceed. 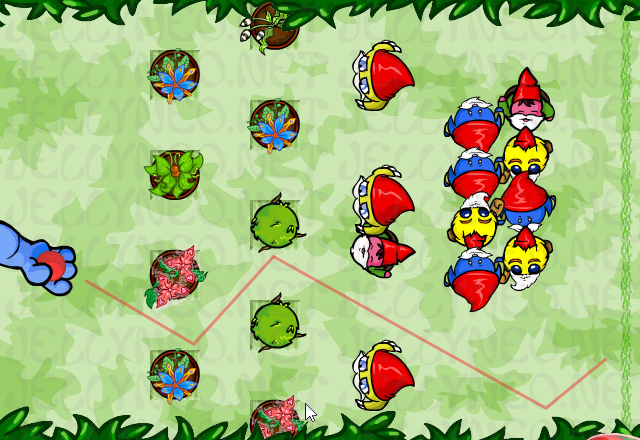 Level 6With three small red-hatted gnomes matching up and down across your path, this level is a bit harder than the previous one, but it's fairly easy to throw the ball through the center when the gnomes have stepped away. Level 7As it can be somewhat difficult to get the angle on this shot just right, you're unlikely to clear this level on your first ball. Aim as seen in the screenshot, and with a little practice you shouldn't have too much trouble. Level 8Wait until the you have a clear shot between the two groups of marching gnomes, and throw the ball. This is far more likely to make it through than if you tried to throw it while the two groups were both on the same side of the screen. Level 9Another fairly simple one, wait until the green-hatted gnomes start walking downward to throw your ball, bouncing it against the top of the play area to reach the goal. 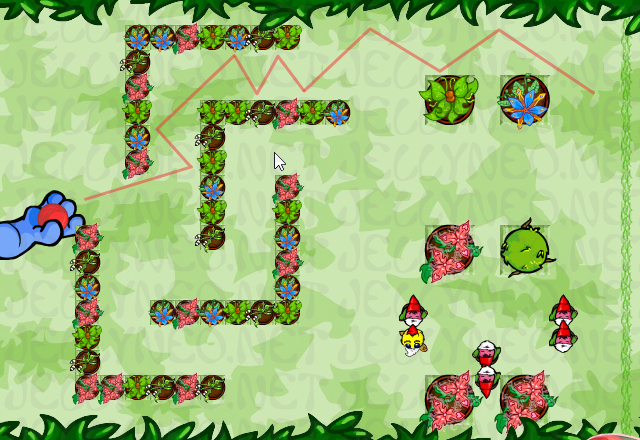 Level 10The path through the center of this level is blocked by two stationary gnomes and a column marching up and down. 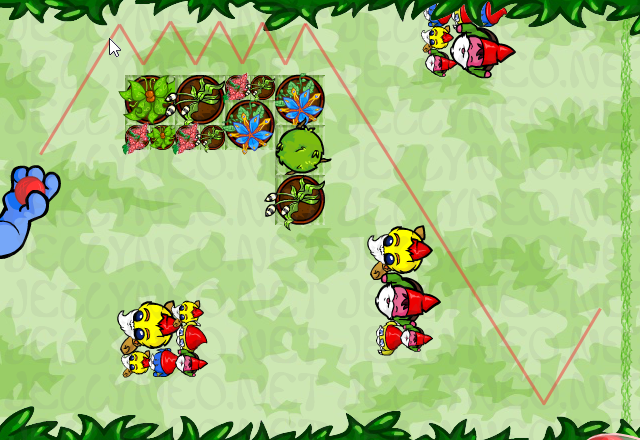 Aim toward the top or bottom of the playing area, and throw the ball when the gap between moving gnomes aligns with the path you expect your ball to follow. 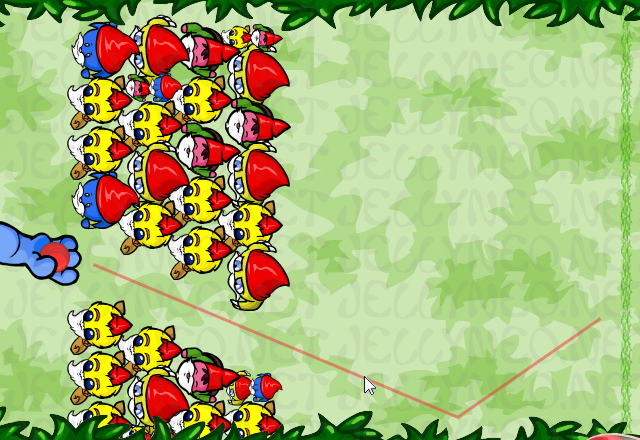 Level 11Aim low, with your cursor a bit to the right of the center of the assembled gnomes. Level 12This level can be a bit tricky, as slight variations in the position of your cursor can cause the ball to bounce differently than expected. 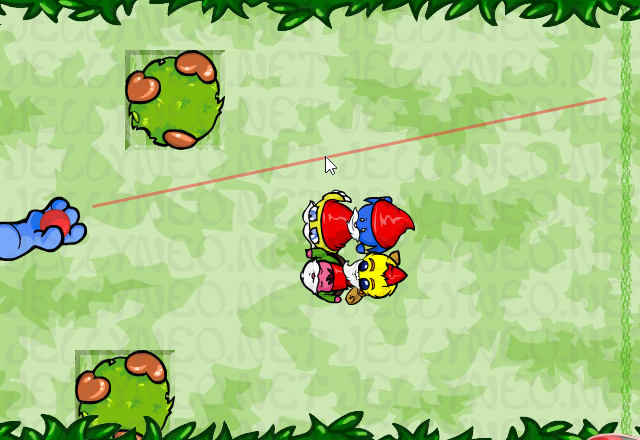 Once your cursor is in place, wait until the gnomes are walking upward from the bottom of the screen to throw. Level 13This level is quite easy, but is entirely based on timing. 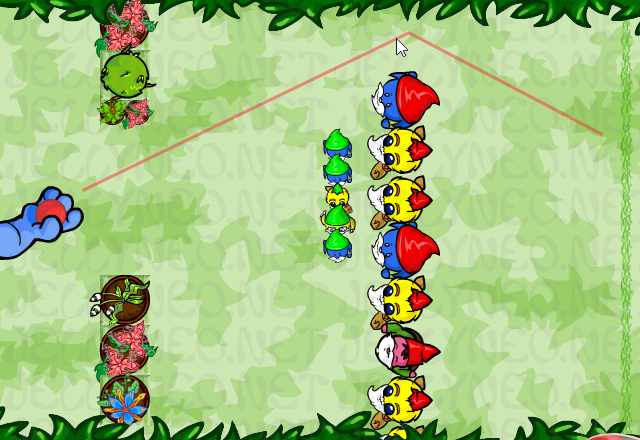 Two groups of red-hatted gnomes are marching against each other, forming an opening and closing gate, while green-hatted gnomes are walking just beyond. 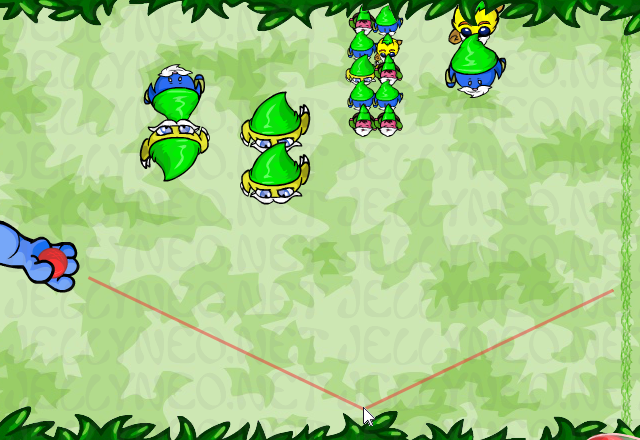 Throw the ball when the red-hats' 'gate' is closed and the green-hats are in the center of the screen; by the time your ball reaches them, the gate will be open and the green-hats will have moved on. 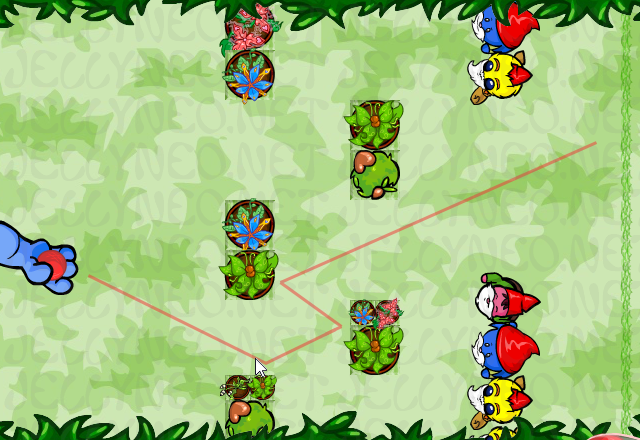 Level 14Another fairly easy level, throw the ball as soon as the gnomes are halfway to the top of the screen. Level 15While this level doesn't contain any gnomes, if your aim is off the ball will reverse direction once it reaches the center of the level, costing you quite a bit of time. 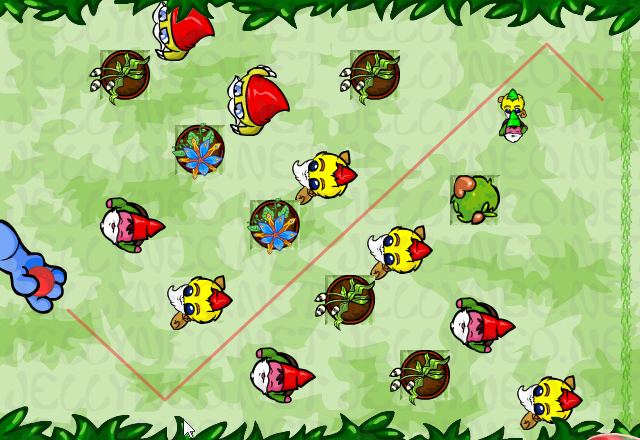 Level 16This level may seem intimidating, but all of the gnomes remain stationary, so you shouldn't have any trouble unless you angle your shot too low. 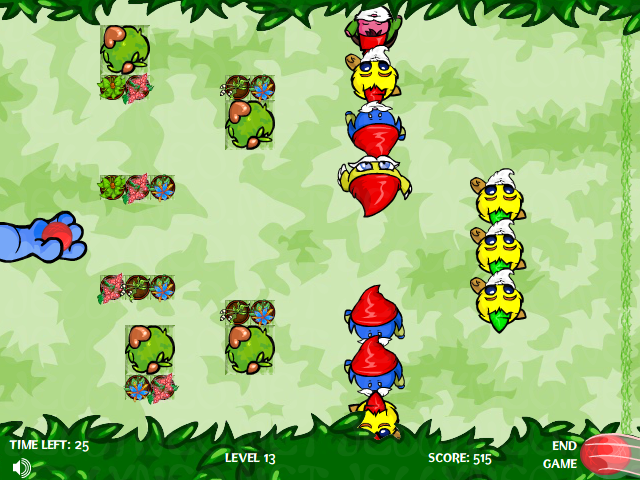 Level 17This level can be annoying, as the timing on it is tricky, and a bit of luck is involved regarding how the game will handle the ball bouncing against the gnomes. Level 18Like the last level, timing and a little luck is required to get through here. While it's possible to throw the ball straight through, this requires practice. You can also angle your shot in a way that it will pass through the first set of gnomes, and by the time the ball reaches the second set, they'll have moved enough that the ball passes through the gap. This also requires practice to pull off with any degree of consistency. 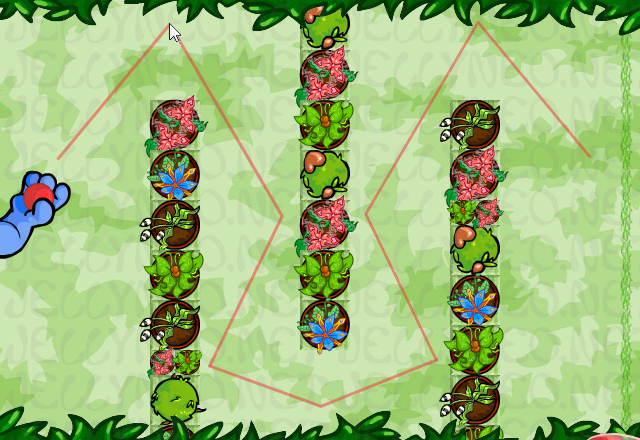 Level 19Quite a bit simpler than the last two levels, you can get through by simply bouncing your ball off of the far corner of the bottom-most set of plants. 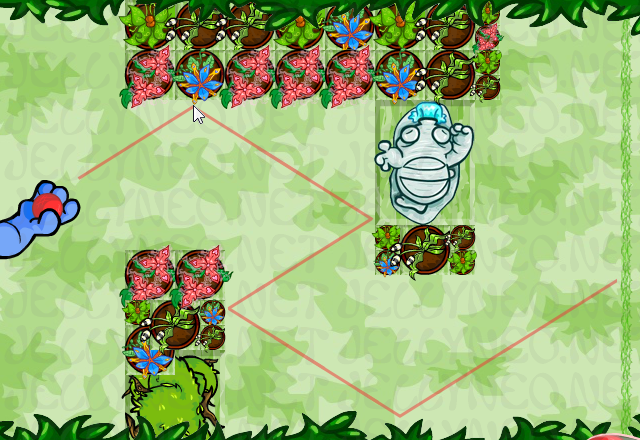 Level 20While you may be tempted to aim at the top of this level, you can pass it in almost exactly the same way as the last one, though you'll need to move your cursor to just below the plants as seen in the screenshot. Level 21Since you need to position your cursor in the center of the screen this level can be trickier than most if you're playing for a high score. If you're doing this, position your cursor just under the second digit in your score where it's displayed on the screen before the level starts. 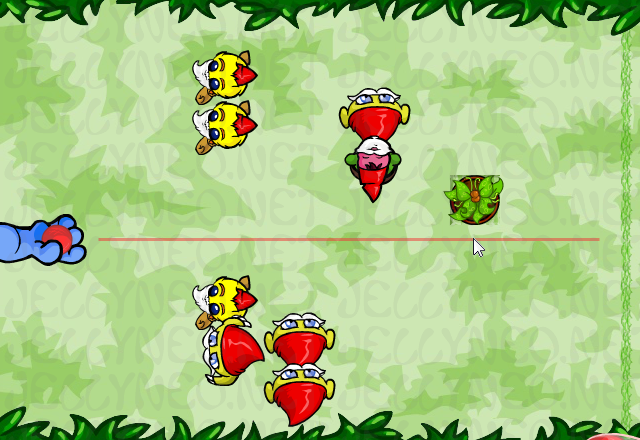 In either case, wait until the gnomes are in the lower half of the screen to throw. Level 22Somewhat of a reprise of Level 4, this one is purely about timing. 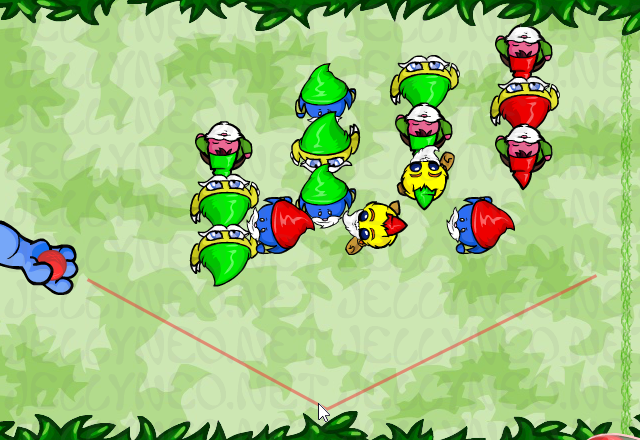 Wait until the gnomes are all on the same side of the screen before throwing your ball. Level 23This level seems kind of complicated, but it has relatively simple timing and cues for the placement of your cursor. 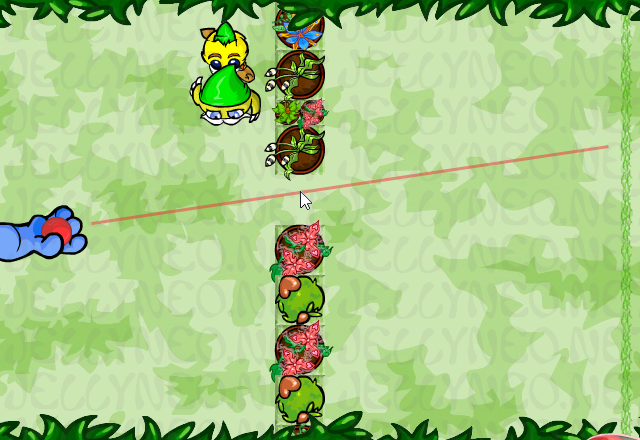 Place your cursor against the right side of the plant at the bottom of the screen, aligning the top of the cursor with the top of the plant. 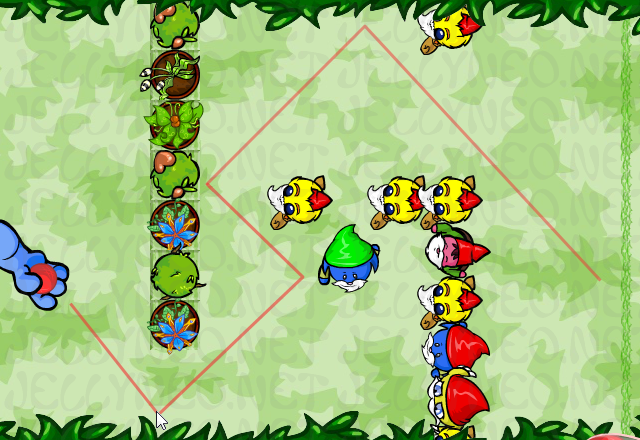 Wait until the left group of gnomes starts to move upward, and you should be able to easily throw it past both groups. Level 24Another complicated-looking level, this one is actually quite easy if you have the cursor positioned correctly. Wait until the green-hatted gnomes have left the top of the screen before throwing. Level 25The final (and hardest) level requires you to wait until the moving green-hatted gnome is in just the right position, at which point you can bounce the ball off of it and around the red-hats. 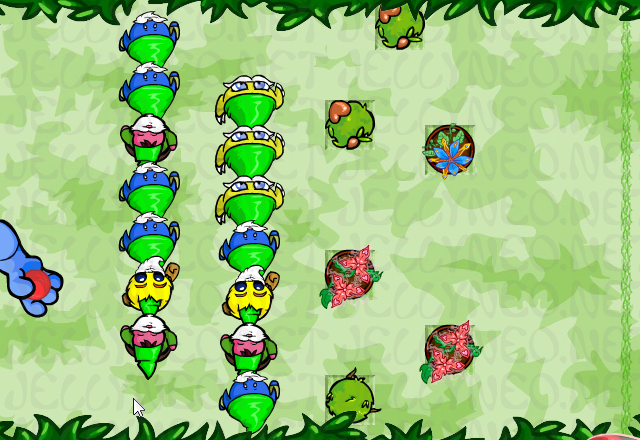 This level takes an incredible amount of skill and familiarity with the timing involved. If you're able to clear this level with a single ball, you'll be well on your way to being a Wingoball champion.